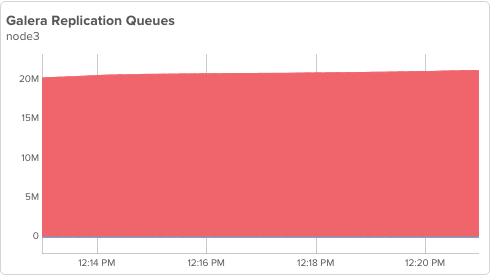 When I say “desynchronized” I mean a node that is permitted to build up a potentially large wsrep_local_recv_queue while some operation is happening. For example a node taking a backup would set wsrep_desync=ON during the backup and potentially fall behind replication some amount. Some of these operations may completely block Galera from applying transactions, while others may simply increase load on the server enough that it falls behind and applies at a reduced rate. In all the cases above, flow control is NOT used while the node cannot apply transactions, but it MAY be used while the node is recovering from the operation. For an example of this, see my last blog about IST. If a cluster is fairly busy, then the flow control that CAN happen when the above operations catch up MAY be detrimental to performance. It’s hard to notice, but node3 is NOT catching up, instead it is falling further behind! We have potentially created a situation where node3 may never catch up. 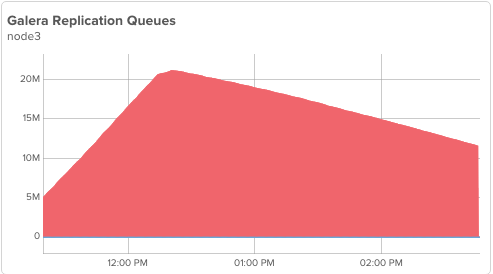 The PXC nodes were close enough to the red-line of performance that node3 can only apply just about as fast (and somewhat slower until it heats up a bit) as new transactions are coming into node1. Nodes do not only need to be fast enough to handle normal workload, but also to catch up after maintenance operations or failures cause them to fall behind. Experienced MySQL DBA’s will realize this isn’t all that different than Master/Slave replication. So at the moment node3 starts utilizing flow control to prevent falling further behind, our write throughput (in this specific environment and workload) is reduced by approximately 1/3rd (YMMV). The cluster will remain in this state until node3 catches up and returns to the ‘Synced’ state. This catchup is still happening as I write this post, almost 4 hours after it started and will likely take another hour or two to complete. 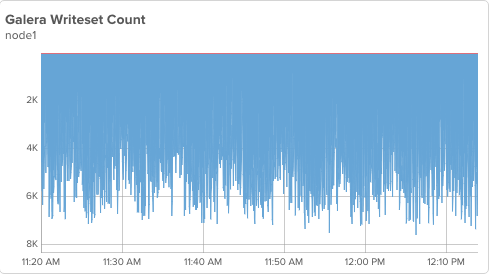 This reports around 20-25 seconds of flow control every minute, which is consistent with that ~1/3rd of performance reduction we see in the graphs above. 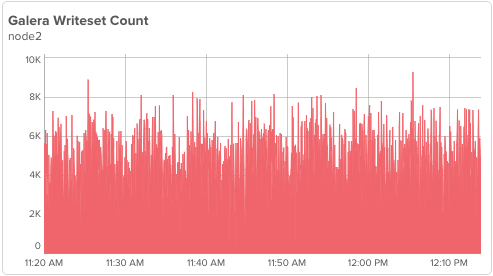 There are a lot of flow control messages (around 30) per minute. This is a lot of ON/OFF toggles of flow control where writes are briefly delayed rather than a steady “you can’t write” for 20 seconds straight. It also interestingly spends a long time in the Donor/Desynced state (even though wsrep_desync was turned OFF hours before) and then moves to the Joined state (this has the same meaning as during an IST). 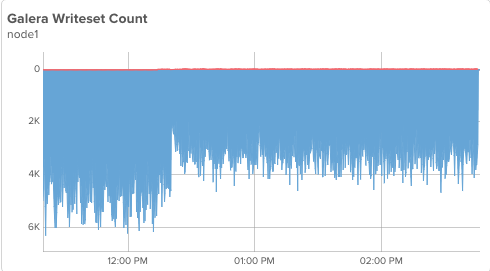 If these are web requests and suddenly the database can only handle ~66% of the traffic, that’s likely a problem, but maybe it just slows down the website somewhat. I want to emphasize that WRITES are what is affected here. Reads on any and all nodes should be normal (though you probably don’t want to read from node3 since it is so far behind). Being at the redline normally means you are well past the redline for abnormal events. 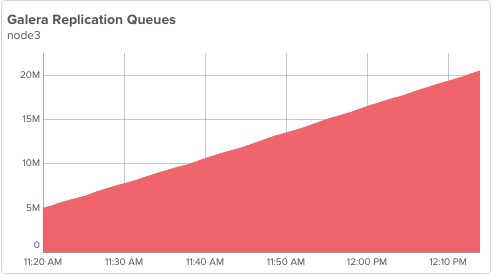 Where possible, build queuing into your workflows so diminished throughput in your architecture doesn’t generate failures. Graphs in this post courtesy of VividCortex. 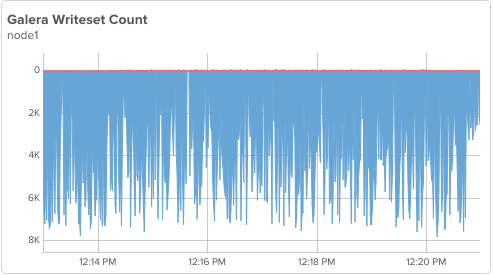 The post High-load clusters and desynchronized nodes on Percona XtraDB Cluster appeared first on Percona Data Performance Blog. The post Percona Toolkit 2.2.15 is now available appeared first on Percona Data Performance Blog.